My name is Michael Sandlin and I am a tattooer from Livermore, Ca. I have the words slow down across my knuckles to remind me to take a minute to enjoy the simple joys of life every now and then. It is good to pump the brakes and smell the roses once in awhile. I got this tattoo a few months ago, primarily as a large step to dedicating my life to MMA and becoming a professional fighter. Touch – up/improvement to come next time I get some work done. 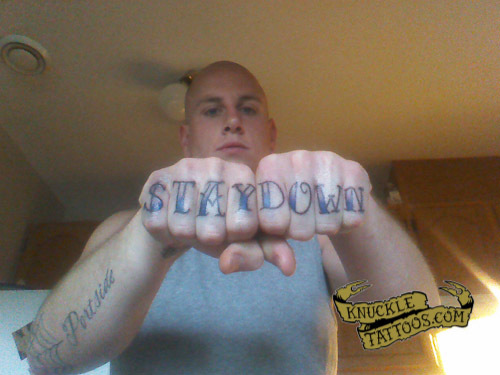 My names Cory Schneider and I have BEAT-DOWN tattooed on my knuckles. I got it when I joined a body-suspension team that was calling themselves BEAT (we came up with quite a few meanings for the anagram, none of which are repeatable in polite company). I got DOWN on the other hand because I have OCD and would have hated to be unbalanced. I always have to explain to people that it has nothing to do with fighting and all to do with my love for body modification. 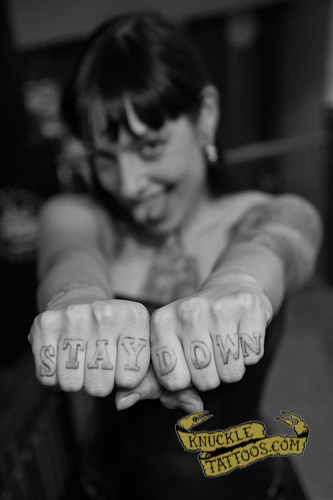 I had the skeletal structure of my hands tattooed around the knuckle tattoos. 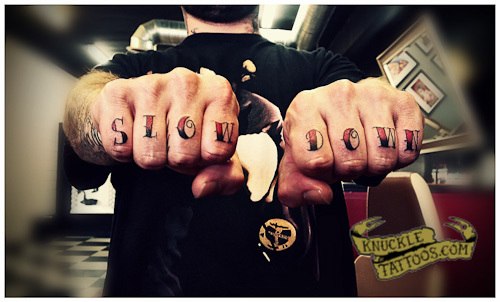 This is my knuckle tattoo. They need to be touched up since they are a few years old but they are mine and I love them. The story is that I was a bouncer/head of security for multiple clubs and bars for 13 years. Fighting has always been a part of my life and now I am training to fight MMA.